Results are in and it is clear that SAWE members would like access to an electronic version of the Weight Engineering Journal. 60% of respondents actively desired an e-journal and 80% were either neutral or positive for the idea. Over 60% were also favorable or neutral towards letting the E-Journal be the standard distribution method. While these are high responses, there is still a well-represented number of members not ready or at all desiring to make a plunge headlong into an E-version of the Weight Engineering Journal. With these thoughts in mind, and yet to experiment with early access, we will introduce the concept by providing SAWE members a downloadable pdf version of the Journal. This format does not incorporate features like flowing text and therefore is best viewed on a screen size which is comfortable for the reader to access the original page-formatted document. It is fine on a desktop or laptop and not too bad on a 7.0in. tablet. As E-Journals are pursued further, mechanisms for appropriate display on a broader variety of user devices will be investigated. 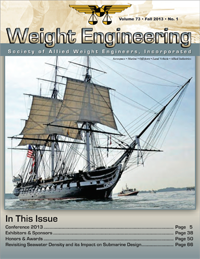 To download the PDF version of the Fall 2013 Weight Engineering Journal, please click here. Log-in to your membership account is required. For more information about how to setup or access your membership account, please view our Frequently Asked Questions.